Tue, Mar 26, 2019, 07:45 pm SL Time, ColomboPage News Desk, Sri Lanka. 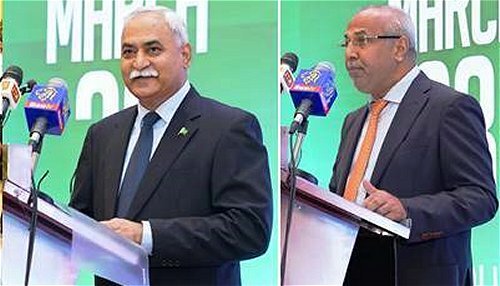 Mar 26, Colombo: Pakistan is considering to establish a world-class high-tech university in Sri Lanka under the auspices of COMSATS and the modalities are being discussed with concerned authorities, Pakistan's High Commissioner to Sri Lanka Maj. Gen. (R) Dr. Shahid Ahmad Hashmat at a function held in Colombo. The Pakistani envoy further announced that the Government of Pakistan, through its High Commission, will be awarding 1000 scholarships to the Sri Lankan students in diverse fields and will undertake exchange of faculty members and students programs. The High Commissioner made this announcement at a reception hosted by the High Commission of Pakistan at Galadari Hotel on March 25, 2019 in connection with the Pakistan's 79th National Day celebrations. In his welcome remarks, High Commissioner Hashmat elaborated that the foundation of strong brotherhood between Pakistan and Sri Lanka was laid in 1948 when the former Prime Minister of then "Ceylon", Hon. D.S. Senanayake, visited Pakistan. While talking about regional security situation, the High Commissioner explained that, despite provocation, Pakistan has demonstrated prudence and extreme restraint as a responsible state. He also said that Pakistan supports peaceful resolution of all bilateral and regional disputes through meaningful negotiations and mediation. He also appreciated Government of Sri Lanka's support for promotion of peace and harmony in South Asia. During his address, Chief Guest, Minsiter Rauff Hakeem paid a rich tribute to the Government and people of Pakistan for always being supportive to Sri Lanka in the time of need. He recalled the robust relations between the two countries and said that Pakistan and Sri Lanka have always maintained close, cordial and mutually supportive relations which are broad-based and multifaceted. 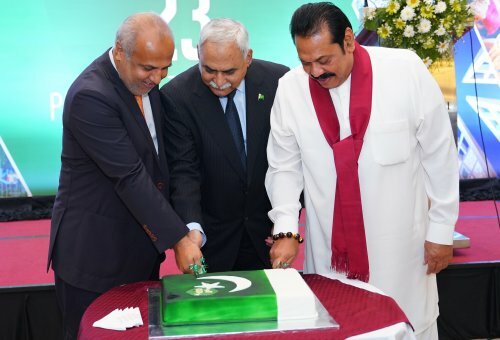 On the occasion, a Pakistan's National Day cake was jointly cut by the High Commissioner, Chief Guest and the Opposition Leader.